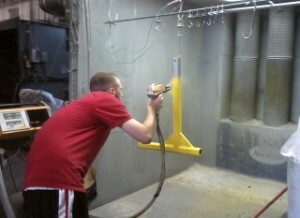 Our electrostatic powder coating facility located in beautiful Bucks County, Pennsylvania is a full service coating facility and is ISO certified. Need a high performance epoxy coating, Nylon, Teflon® (PTFE coating), Dykor, Kynar, or a specialty coating applied to variety of surfaces? Corro Therm is also experienced with wet spray for industrial and military applications. Our customer base is located in Bucks and Montgomery Counties, Philadelphia and New Jersey. However, we also service clients throughout the United States and Canada. 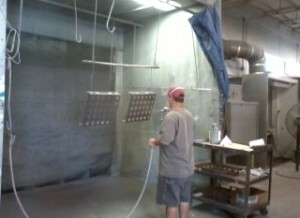 You will find our staff is highly experienced in a wide variety of coating applications. Call us today at 215-322-5255 to discuss the details of your project or use this web form to request a quote. For those who prefer to purchase and apply their own coatings, you can buy industrial and protective coatings and have them shipped directly to you. 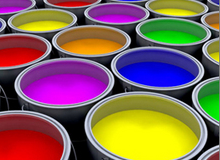 Some of the brands we carry are PPG/Ameron Industrial Coatings, Carboline Paints and Coatings, and Rust-Oleum Industrial Brands. As large distributors for anti-corrosion coating, we can buy materials at attractive rates and pass those savings onto you. We manufacture a distinct line of specialty products. CT-334 is a ceramically bonded aluminum filler that helps eliminate costly repairs. 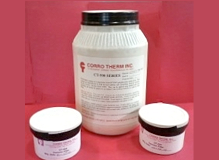 CT-500 coating system is a Ryton®-based (PPS) coating which works similar to DuPont™ Teflon®. The CT-33 series of coatings are aluminum-filled ceramic coatings and our unique Coricone 1700 Metal Sealer® is the perfect coating for non-ferrous metals. to discuss the details of your project or use contact us to request a quote. But here super kamagra it is already not so simple to find in nearest shop because not such popular and it is bought quickly by those to whom it is necessary.